Rose is no stranger to the difficulties faced by displaced women and families living in Maai Mahiu. Every day, she wakes early to read her Bible and pray before heading out to meet these women and these families. She tracks down single moms while they are out working as prostitutes, she visits their homes, sometimes she even watches (or raises) their children. Rose is no stranger to the difficulties a displaced family faces because she, too, had to flee from her home when bloodshed threatened her life and the lives of her family. In 2007, violence erupted throughout Kenya following the presidential election. 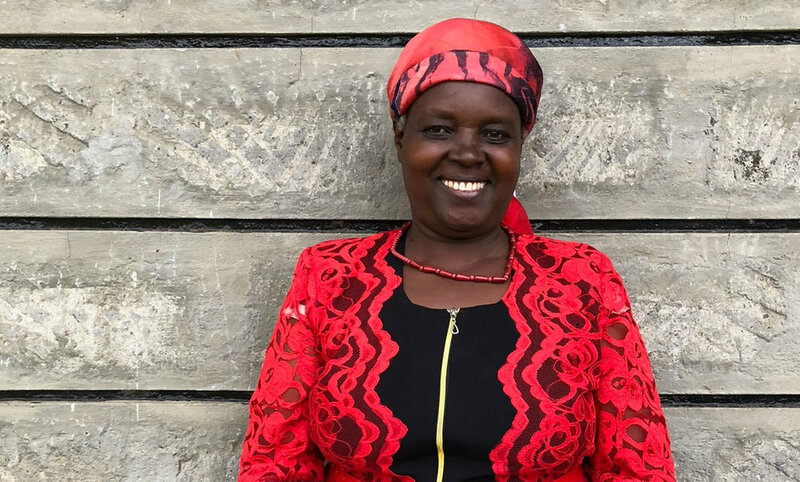 Rose’s home in Eldoret, Kenya was burned, but fortunately Rose and her children escaped and landed in Maai Mahiu where they lived in a government-issued tent for two years. Six of Rose’s seven children were with her, while one was separated from the family for a year during the violence. The family arrived in Maai Mahiu without any of their possessions and many challenges ahead of them. Rose did not know if one of her children was dead or alive, she had no means of income, and she knew she was entering a community where drugs and prostitution were rampant. Before leaving her home, Rose ran a successful business selling shoes, clothes, and materials. She worked hard and was able to provide for her entire family. Once in Maai Mahiu, she knew options for income were much more scarce and that many women felt forced to enter prostitution to provide for themselves and their families. Rose decided against that decision. Instead, she began to farm and soon after that, she started making bags and selling them around camp. She says because of her faith, she trusted that God would provide opportunities for her and keep her and her family safe from being exploited. Rose continues to stand on her faith in Christ, and it’s this faith that fuels her to care for the women in her community. For the past five years, Rose has worked with Woman of Courage, a program supported by Rift Valley Fellowship Church (RVF) and His Voice Global, to provide economic opportunities for women and young girls outside of prostitution. Initially, Rose and five other women made up the group – they would gather to make bags and support each other. Now, they train others to join them and look after young women in the community at risk for entering prostitution. Since they started, RVF has helped rent houses for many of these women which provides additional protection as they learn how to support themselves financially. Rose knows her past trials have allowed for her to get to know the women in a special way. Her experiences provide her with opportunities to speak truthfully and honestly with the women in Maai Mahiu while still recognizing their specific needs. In turn, Rose has seen lives changed – women who have stopped drinking stopped prostitution and are now empowered to provide for their children. “Women are my heart,” Rose says. Her passion for seeing the women she works with make different decisions and succeed on their own continues to push Rose forward - so much so that she didn’t stop her work even when she had malaria last year. She hopes to see living conditions for women in the community continue to improve and specifically that more affordable housing options for families become available. We don’t doubt Rose’s ability to help accomplish these goals. Read more about our partnership in Kenya. Copyright © 2019 His Voice Global. All Rights Reserved.